It's already August! Where has this year gone? Christmas is literally right around the corner. So, let me help you get a constant discount on your holiday paper crafting supplies! Have you ever thought about becoming a representative for Stampin' Up! ? I totally understand during these difficult financial times, that one more commitment can be a bit over whelming. But, it doesn't have to be! If you are like me, you make your own cards, yes, even holiday cards. You make your own party decorations and supplies. And you need every little discount and coupon available to make your creative dollar go just a bit further! Well, during the month of August, you can sign-up to join my team, Hoot's Got Stamps?, become a Stampin' Up! 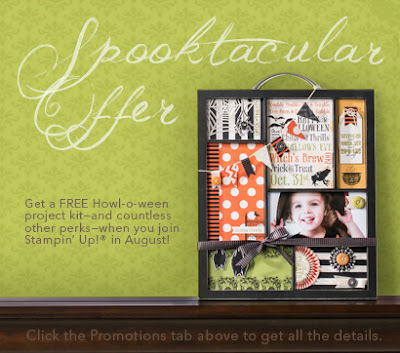 demonstrator to receive a constant discount on all the products Stampin' Up! has to offer, and at the same time earn free stamp sets and products! Receive business tips and participate in business exercises to further your Stampin' Up! career! Also, it only costs $99 to join this month! And you get to select what products you would like to start with, to create your own 'starter kit'. You will also receive this super fun and creative project kit, valued @ $60 for FREE! Join my team and receive encouragement and guidance on this new adventure! Contact me with all your questions. We can meet to chat and have a coffee. Join me, won't you?